Posted in: Books. Tagged: alexander hamilton, American history. I’m trying very hard this holiday break to wade through my enormous pile of unread books. As a first, tiny success, I just finished reading Ron Chernow’s biography of Alexander Hamilton. I thoroughly enjoyed the book on an intellectual and personal level, but, surprisingly, it also relieved some of my anxieties about today’s political tumult in the US. Every worrying element of the modern political landscape seems to have had some historical parallel in Hamilton’s time. An endless stream of fake news stories stressing you out? In 1796, just after George Washington’s farewell address, the Aurora newspaper accused him of having conspired with the British during the American Revolution (p. 507). Worried about US officials making backroom deals with foreign governments? Thomas Jefferson met secretly with France’s ambassador to sabotage President Adams’s negotiations to avert war with France during its own bloody revolution while Jefferson was vice-president (p. 547). Troubled by signs of suppression of the press? While it controlled the government, Hamilton’s Federalist party passed the Sedition Act in 1798, which criminalized making false statements that were critical of the federal government. Alongside the vivid portrait Chernow paints of Hamilton and his life in the newly founded nation, these stories make this biography as relevant and alive as news posted yesterday on facebook. And as just in Hamilton’s time, the political turmoil and truculent partisanship seem to threaten the foundations of our government. Unlike Hamilton, though, we have 200-plus years of democratic traditions to reflect on as we face our current political crises. 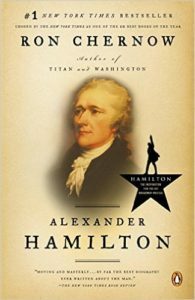 Chernow’s rightly acclaimed biography is emotionally engaging, replete with detailed anecdotes from Hamilton’s life, and reassuring, showing that American politics has always been raucous and exasperating.